Character study of a barking dog. Carved in hardwood with what appears to be bone teeth. 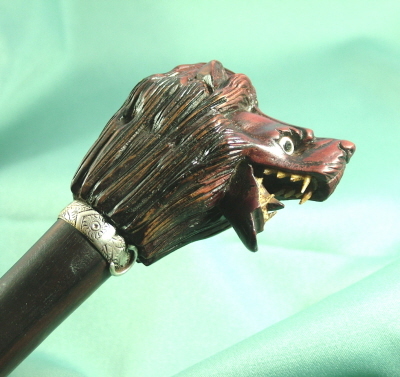 Mounted on rosewood shaft with original base metal ferrule. Upper collar not holding Assay but lower collar holds Assay for Birmingham 1904. Good original condition free from breaks or cracks. Eyes likely to be a later addition.